The Open Class World Champion might have been crowned Tuesday night, but Open Class corps aren't done competing yet. 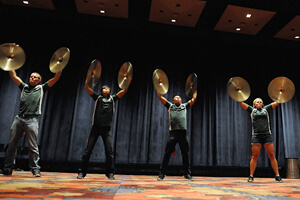 The Open Class Individual & Ensemble Competition (I&E) kicked off World Championship events in Indianapolis on Wednesday, Aug. 8 at the Indiana Convention Center. "It's smaller than last year, because of the fewer amount of corps participating, but there's still incredible enthusiasm," I&E event manager Christina Mavroudis said. "The talent I've seen so far is extraordinary." Early in the day, the event drew in a sizable crowd. Among the spectators was Colleen Vanover from California. She traveled to Indianapolis to see her grandson compete with Boston Crusaders, but decided to check out what the Open Class corps members had to offer. And while running the event, Mavroudis met a man from Tennessee who was attending the World Championships as part of his bucket list. "He decided he was going to start with Open Class I&E," she said. "And he is here now watching all the ensembles. He's very excited." Throughout the day, 11 corps were represented at I&E. 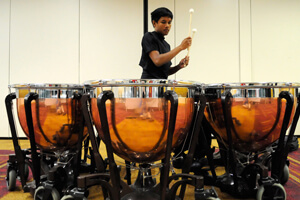 Among the usual color guard dancers, drummers and solo and ensemble brass players, were also two barbershop quartets, a juggler, and the annual Fastest Drummer Competition which was won by Blue Devils B's Steven Drummer who clocked in at 923 strokes in one minute. "Quite a number of them are first time performers," Mavroudis said. "It's a little scary for them. But they're meeting their fears head on." Dana Brown and Chrissy Nadeau kicked off the ensemble competition with other brass members from 7th Regiment. Both are tuba players in the corps. "We both started [playing tuba] in high school, and we both started on different instruments," Nadeau said. "It's exciting to be here." The pair said they've been rehearsing since the end of June, finding time during meal and laundry breaks to practice their routine. The judges in their room were Joe Allison (percussion) and Mike Rubino (brass). "The score sheet gives 50 percent emphasis to performance excellence, and 50 percent of the score goes to the effect of the performance," Allison said. Allison is a faculty member at Eastern Kentucky University, and he has been involved with DCI for 34 years. View a complete schedule of 2012 World Championship events.